I made this simple chevron quilt just to practice my quilting… A few weeks ago I got a set of Quilters Apothacary rulers The Mysicurve2 they come in a set of 6. I’ve had so much run with these… the 1st project that I worked on was a sunset wall hanging. I can’t show you the whole thing as part will be for the My happy place Row Along blog hop that I am joining again this year.. starting in September 2018 but here is a sneak peek at my quilting… Keep in mind this is the 1st time I have ever used curve rulers on my long arm.. I made the top using Half Square Triangle and sewed them so that i had a dark Half and a light half. Once the top was finished i realized that i had forgotten about my borders so on my way to Sask a couple of weeks ago we stopped in a little quilt shop out by Lashburn Saskatchewan and purchased the perfect border fabric… the reason for my stop at this particular shop is that she had this cutting board that was teal on one side and fushia on the other and i thought it would fit perfectly into my new studio. Shannon McGilvery from A notion to sew and Quilt has a cute shop and with the friendliest atmosphere. She had Snacks and drinks for the kids and Coffee to refill hubby’s to go mug. My hubby even enjoyed visiting with her as I shopped. 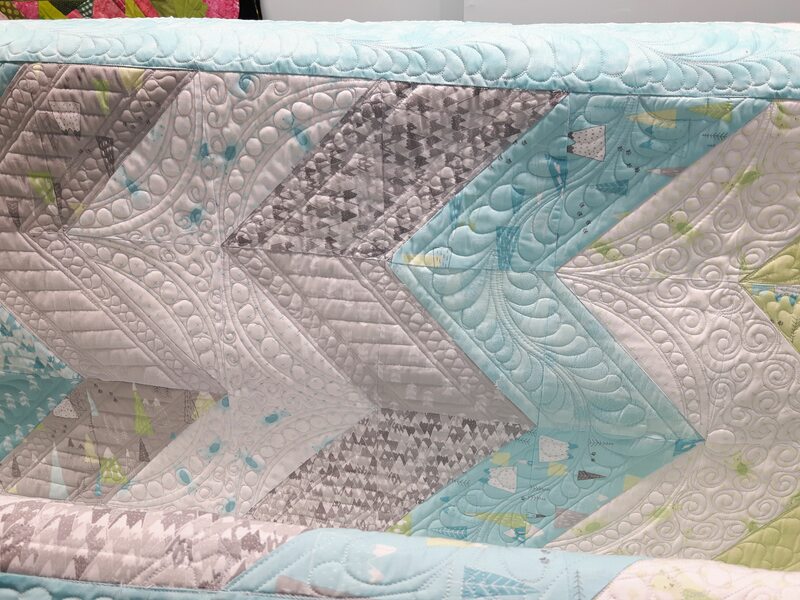 This local quilt shop is a definite stop in the future..
Now for the quilting, I could not have gotten the results without the help of ideas from Pinterest… this quilt was perfect to work in rows to try different quilting patterns. I used straight edge to do all the in the ditch and straight lines following the zig zag and piano keys. The curves were done with the arch misti curve rulers. and the rest was all free motion quilted… the only time that I used a marking pen ( i use the air/water erasable purple pen on this light quilt) was to mark of the middles reference points. Hope you enjoyed seeing what just finished… I can see improvements with each quilt I work on… I’m sure you can too.